WFTV broke a major story exposing a questionable land sale between the City of Orlando and the Black Business Investment Fund (BBIF). WFTV’s Lori Brown reported that “City staff did not disclose some critical information” the $2 million land deal was about to slip through the consent agenda with no discussion. Brown also reported the BBIF currently owes the City nearly one million dollars. The BBIF has also been under fire from the state of Florida for overcharging $1 million in loan servicing fees. The land deal in question revolves around a lot in Parramore the City sold to the BBIF in 2005 for $814,000. According to the WFTV report, three years later, the City of Orlando gave the BBIF $878,000 in economic incentive money to develop Carver Theatre. The BBIF never developed the land. Now, Mayor Buddy Dyer and the City of Orlando are ready to buy back the vacant, undeveloped land for $2 million in tax dollars. “They don’t want anyone to know what they are doing,” Lawanna Gelzer told WFTV about the City of Orlando and Mayor Dyer. The lot in question also happens to sit right across the street from the planned Major League Soccer stadium. Of course, Mayor Dyer is still attempting to seize Faith Deliverance Temple, the church fighting the City’s eminent domain. If that happens, you can bet this land across the street will become future parking or corporate offices for the new MLS team, just like the Magic have across from the Amway Center. This is just further proof that Dyer is transforming the historic African-American neighborhood of Parramore into a sports complex with gentrification and corporate welfare. 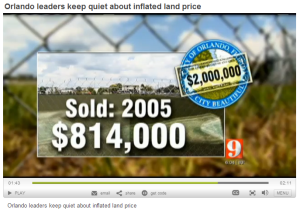 One Response to "WFTV Exposes New Inflated Land Price Deal Between City of Orlando & BBIF"